It’s safe to say that Fallout 76 got a negative reception at launch. The game’s initial quality – and a variety of related issues from the canvas bag kerfuffle to the support ticket meltdown – caused a swath of gamers to swear it off entirely, but a loyal group of players has remained to enjoy the incremental benefits of new updates and bug fixes. But the latest patch has launched in such a bad state that even the game’s loyalists are starting to question their resolve. For a limited selection of things that went wrong, the January 29 update broke bulk junk crafting, so that you can efficiently craft with the materials you’ve condensed. Bobby pins, which once took up an absurd amount of inventory weight before they were fixed, are back to their old heft. Plans you’ve learned show up across every character on your account. 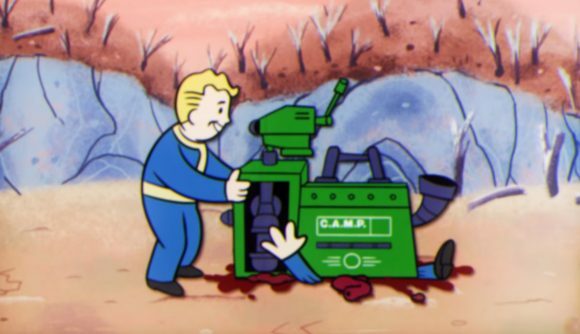 Those issues were introduced after “a merge of internal development builds failed to execute properly” and are the subject of incoming hotfix, as Bethesda details on Reddit. But those are just the unintentional problems – the intentional changes in this patch have been even more controversial. Quickly browsing through the official subreddit will bring you to all sorts of criticism over specific details, as well as broader condemnations of the game’s direction. You’ll find thread titles like “I feel so awful for convincing my friends to buy fo76,” “Defending Bethesda does not help the Fallout community,” and “If you’re done with FO76, uninstall” – and those are just a few items that the front page today. Our Fallout 76 review notes all sorts of issues with the game as it launched, but the hope remained that we’d see a steady set of updates and improvements as the live service continued. There have certainly been updates, but whether or not they constitute improvements is a growing point of concern.